Recently I visited the city of Bath, in Somerset, for the first time. 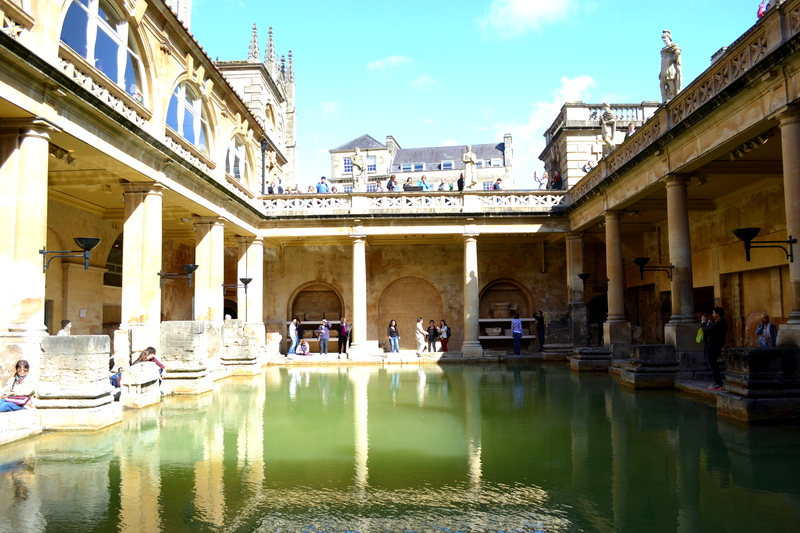 In ancient times Bath was the site of a hot spring, a place treated as a shrine by Iron Age Britons. A temple was built on the site in 60-70AD, during the Roman occupation of Britain. A complex of public baths gradually developed there over the next 300 years. The Roman name of the town was Aquae Sulis. Its location within the contemporary Roman Empire can be seen on this map. Bath Abbey, as seen from the Terrace of the Great Bath. The indoor bath houses originally had mosaic floors. Side view into the King’s Bath, with Georgian railing. The Roman Baths fell into disrepair with the fall of the Roman Empire and Roman withdrawal from Britain early in the 5th century. However the baths’ popularity enjoyed a resurgence during the Regency period, with fashionable Georgian society becoming interested in bathing in the warm waters of Bath’s natural hot mineral spring. The orange line around the King’s bath shows the water level in the Georgian period. You can see they added metal rings to the wall, and steps and rails to improve access to the bath. The water level has since been lowered to its original Roman level. The sacred spring at Bath. The Great Bath. This view is from the corner of the bath where the hot spring water enters and fills up the pool, coming out from a channel under this stone. The sun suddenly came out at one point, enabling me to take some quite different pictures. The sunshine really enhanced the colours of the green water and blue sky. The roof of the Roman temple was constructed of special hollow bricks. The reflections of the columns in the pool highlight the architecture of the baths. In Roman times public baths consisted of hot water baths, warm baths, and cold baths, and also sometimes a dry-heat steam room, like a sauna. This is the cold plunge pool, which the bathers would dip themselves in after bathing in the warm Great Bath above. In the pump room there is a tap providing treated spring water for the visitors to drink. It is warm, and rich in minerals… and tastes quite like bath water! Some more pictures of the Great Bath, in sunlight. The Great Bath, with views of Bath Abbey. On a cold day, a mist rises from the bath as the hot spring water makes contact with the cold air.